‘Burden of Love’ was inspired by Victorian English embroiderer and renowned artist’s muse Jane Burden, the wife of the late great William Morris and the lover of Dante Gabriel Rossetti. Jane came from a humble background and married Morris very young, already knowing she wasn’t in love with him. During one of his many absences (traveling the world in search of peace and inspiration for his incredibly design works), she formed a deep and passionate attachment to one of his best friends, Rossetti. The love affair was ultimately doomed, given the judgmental times they lived in and Rossetti’s drug addiction, but they stayed friends until his death and she remained quietly imprisoned in her dignified and respectable marriage, playing the role of muse, wife and mother to Morris’s children until her own death. 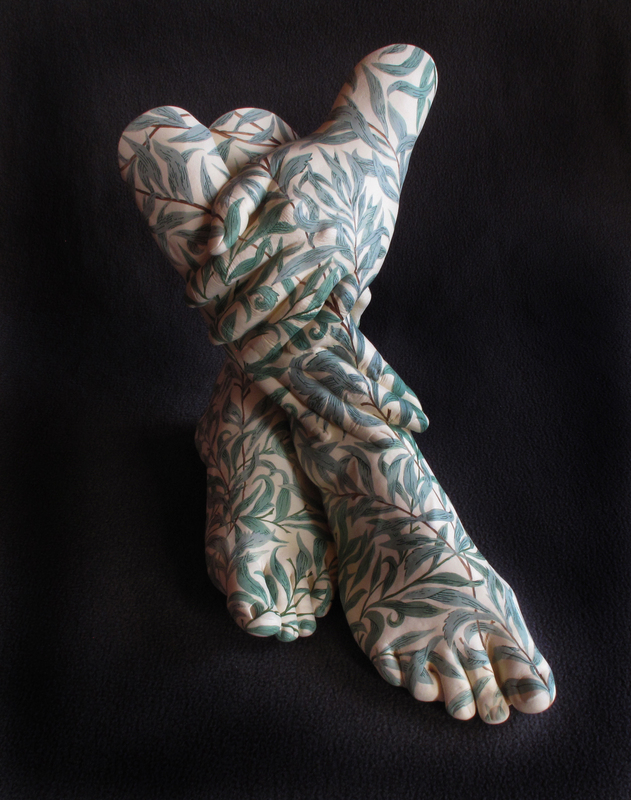 ‘Burden of love’ is a lifecast sculpture depicting Jane as the eternal artist’s muse, striking a pose that suggests relaxation, the traditional Pre-Raphaelite contemplative romantic revery, but her skin is adorned with the work of her husband - intricately reproduced by hand by me (CJ Munn) in acrylics with a traditional cow’s milk glaze. Jane’s ‘work’ as muse is somewhat lost and suffocated beneath the iconic designs of her husband to the extent where she, her feelings, her passionate longing for her lover, her pain at being trapped in a loveless marriage to maintain that all important reputation in Victorian England - are silently, neatly and beautifully subdued and erased. Jane’s own talents are always seen as secondary to her husband or lover. Her ambitions and desires always taking a polite, well-mannered, sullen back seat to those of the men in her life. Her sadness becomes the melancholy beauty enjoyed by others in seeing the great works she inspired. Her pain becomes the gain of the beholder. 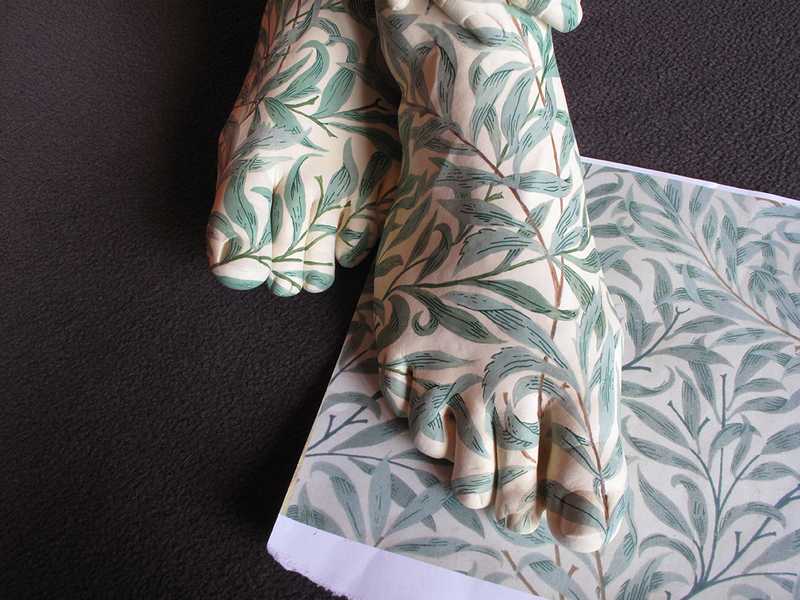 For this piece ‘Willow Bough’ was chosen as the pattern to be painted on the lifecast hands and feet, as the English Weeping Willow tree seemed distinctly apt to reflect Jane’s quiet, dignified suffering. Picture one shows the finished sculpture, picture 2 shows a close up next to a sample of the William Morris wallpaper design ‘Willow Bough’ so you can see how accurate CJ’s paintwork is in reproducing this design by freehand painting, Picture 3 is the work pre-painted in progress so you can see the lifecast itself more clearly and picture 4 shows the artists Masters & Munn with the model for the piece, posed ready for the alginate to be applied. Other photos of the alginate being applied are available on request but this one had both of us in the photo. This piece was commissioned by Michael Parry, biographer of William Morris and Chief Archivist of Morris & Co (the company started by William Morris and his associates over 150 years ago).